"An exhilarating portrait of a unique truth-teller...the artist as a socially conscious provocateur." "Fascinating. A rangy, unconventional ride. A fine, thoughtful documentary. A pleasure to watch. 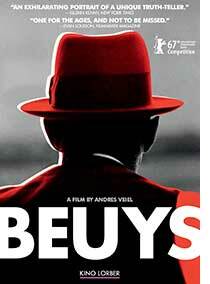 Working engagingly with material culled from years of archival footage, it presents the work that was Joseph Beuys - as well as reminding us why this most political of contemporary artists is still relevant today, more than thirty years after his death."